We love games. We love our work. We make awesome Viking things. Big Viking Games, founded in 2011, is the largest independent mobile and social game studio in Canada and a pioneer in mobile HTML5 games. The company has grown profitably to a team of over 100 Vikings across two studios in Toronto and London, Ontario. From our beginnings with hits like FishWorld and YoWorld, we have become a leader in live operations, and a pioneer of what is possible with mobile HTML5 technologies to redefine the future of mobile entertainment. Our titles are played by millions of people on iOS, Android, Facebook and the mobile web. Big Viking Games is lead by Founder and CEO Albert Lai. Albert has been a passionate gamer for his whole life, so it was a natural fit when he turned his significant business experience to the gaming industry. Albert’s long history as a serial entrepreneur started in his teens when he sold his first Internet company for a seven-figure sum. He was most recently the co-founder and CEO/President of Kontagent, a Facebook-funded analytics platform that tracked one out of every four dollars spent on Facebook-connected games. Prior to Kontagent, he was the founder and CEO of BubbleShare, a photo-sharing company that was sold to Kaboose/Disney. 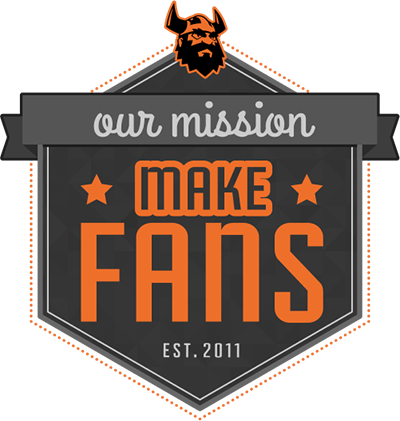 Our mission at Big Viking Games is to Make Fans—both in game and in our studio. We aim not only to create passionate fans, but also passionate employees. As a team, we are always looking to challenge each other to work to our full potential in order to build something great. This combination of passion and talent creates a solid foundation for the high quality games in which we pride ourselves. To learn more about what it’s like to join our Viking horde, see our Careers section. Our London studio is home to the majority of our vikings and is situated downtown, close to unique shops and restaurants. With a low cost of living and an accessible location, London has become a great place to live and work. Our Toronto studio is rapidly growing in the heart of downtown Toronto at Front and Simcoe Street. We are surrounded by a multitude of startup communities, giving everyone an environment where it’s easy to level up.